AVAILABLE FOR CANADIAN CARS WITH DUAL CHAINS! The material we now use is for axles is 4150 HT TG&P, we did use Rychrome at one time but 4150 is stronger. 4150 is a material with .50 chrome, HT means heat treated and TG&P stands for turn, ground and polished. (1 7/18" diameter axle). The front axle bushing joins the two stub front axles inside a steel tube and allows the front wheels to rotate independently so that the car can be easily turned. M-24099 FRONT AXLE SPLIT BUSHING 1 3/16"
M-16103 FRONT AXLE SPLIT BUSHING 1 7/16"
FRONT AXLE SLEEVE - This sleeve joins the two front stub axles. The Front Axle Split Bushing Illustrated above is used to join the axles and allow them to rotate independently inside this sleeve. HUB PULLER Ever have difficulty removing a wheel hub from the axle? Of course you have! So have we. We've even heard of some who have used a 20 ton hydraulic press without success. It is a very difficult job and, if improperly done, very easy to damage the axle. To solve the problem, we have designed a plate properly drilled with the correct length bolts to make the job fast and easy with normal hand tools. 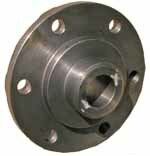 Pullers are available for 14" & 16" wheel hubs. MT19 & MT14 CHAIN PLATE - P/N F-103831 This Chain Plate is an exact replica of the original and is powder coated. Install it with the Chain Whip Blocks in the next row and have a complete Chain Guide Assembly. MT19 & MT14 NYLON CHAIN WHIP BLOCKS - If your chain Whip Blocks are worn out or missing, now is the time to replace them. Stop that chain from whipping - replace the guide blocks. Available with or without brackets. DRIVE CHAINS - #50 single and #40 dual chain (for Canadian cars) is available cut to proper length for MT14, MT19 and our MT19 axle sprocket modification kit. Order an offset link to size chain length for an odd number of rollers and a master link to join chain ends. Chains do wear out so carry a spare and/or replace your exsisting chain. MT19 SPRINGS - The black one on the left is for the rear axle and the silver spring on the right fits the front axle - front and rear are different. A broken spring can take you out of an important meet. Not a bad idea to replace your old springs if you are re-building an old car and to carry some spares for that unexpected moment. Order the special nuts used to center the springs - yours will probably break when you try to remove them. 14" & 16" FAIRMONT WHEEL SHIMS - Is your car undergauge? If it is not tracking well, it maybe time to check your wheel gauge. If you are undergauge, these shims are the answer to bring the wheels to the proper gauge without pulling the hubs and shimming the axle. They come in 2 sizes - 1/16" and 1/8" thick for fine or coarse adjustments. BEARINGS We have 'em all! 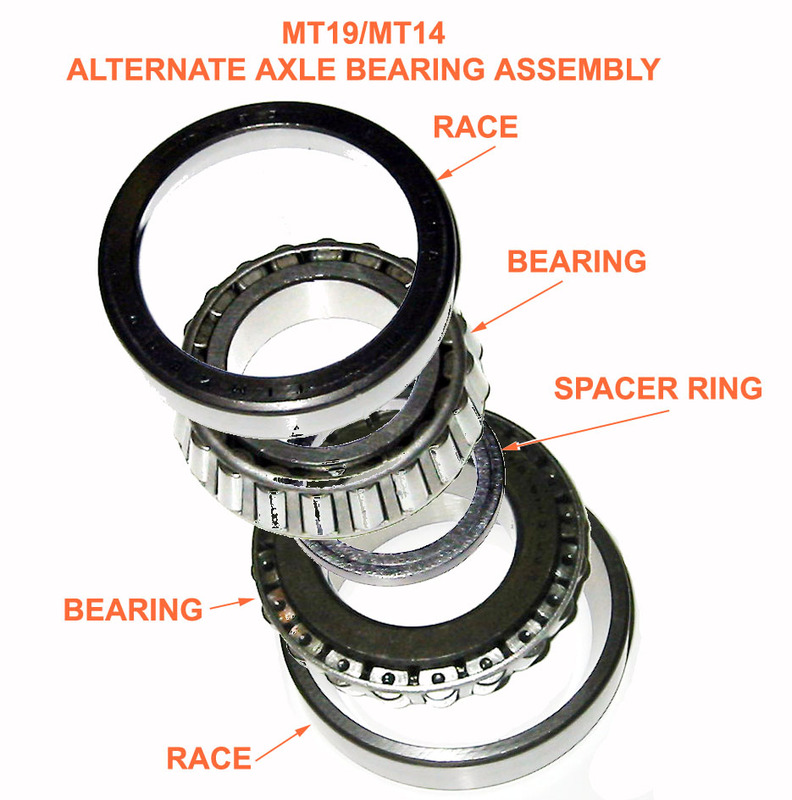 M9/M-MT14/M-MT19 AXLE BEARING KIT- AUSTRALIAN SETUP We have discovered that Australian cars use a different bearing (much less expensive) than the bearings installed in US and Canadian cars. CLICK HERE FOR A LARGER VIEW. These beaings are installed with a special spacer ring between the bearings to provide the proper fit in the housing. We have manufactured this spacer and can supply the complete assembly of bearings, races and the spacer ring as a set only. M9/M19/MT19 GUIDE TUBE PLATE The Plate is illustrated in the lower part of the photo. The top object shows the plates assembled on the guide tubes and bearing block. 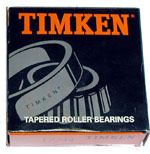 The bearing block and guide tubes are not included. If you are rebuilding a car, or have reason to remove the bearing blocks, check the condition of the guide tube plates. Two plates are used with each bearing block. CENTER AXLE BEARING ATTACHMENT HARDWARE - We have frequently found the bolt and bushing assembly used to attach the center axle bearing to the attachment fitting on the chassis crossmember to be badly worn. If you check yours, it is probably worn also. 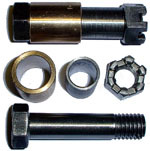 We now have the bolt, nut, bushing and spacer assembly available. It is easy to reach and should be changed if extra play is found. Includes M16246 Bolt, F2545 Hex Slotted Nut, 46504 Bushing, M19971 Spacer Tube (inter bearing race). CHAIN GUARDS - Now available for MT14 & MT19 cars. These guards were originally available fron Fairmont and prevented oil from slinging from the chain to the inside of the engine tunnel. The front guard, illustrated in the top photo attaches to the two bolts that secure the transmission cover on the right side of the gearbox. The rear chain guard,illustrated in the lower photo, is bolted to two exsisting holes in the longitudinal angle that supports the chain whip guard plate. It covers the top half of the chain as it passes over the rear axle sprocket.